An incomplete and corroded copper-alloy Roman barbarous radiate, probably copying a coin of the Gallic Empire, dating to the period c.AD 275-285 (Reece period 14). Reverse type depicting Laetitia standing left holding purse and anchor. Unclear mint. 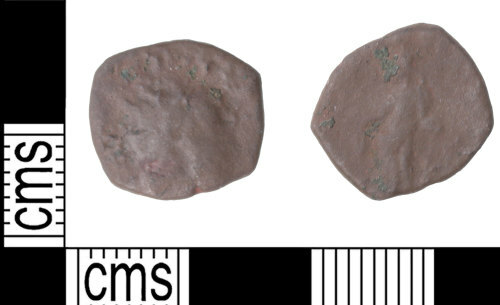 This coin probably copies one of the Gallic Emperors, perhaps Victorinus (AD 269-271) or Tetricus I (AD 271-274), although it should be noted that the thickset bust is also reminiscent of Carausius (AD 286-293).